I’m not sure if it’s the economy... or the dismal football we are playing at present... that saw the lowest number of members make the journey for the first official DH trip of the year. It was also the first trip that our travel secretary didn’t travel on which left us a bit leaderless. Thankfully Liam McDonagh became the chief “minder” for us all. 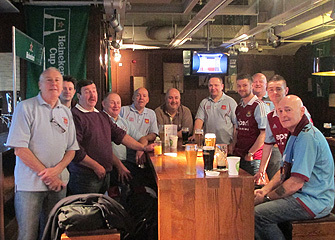 Anyway, 14 of us brave souls met in the airport bar at 7.30am and commenced the age old DH tradition of sinking a few refreshments. Being the sensible type I opted for coffee. As ever our hopes and dreams for the few days trip were high as we sought to find the positives to our current dilemma of not having a striker. Rumours that Sam was going to go one step further in his no striker tactics by fielding a five/six/minus one formation had us all baffled! The flight was delayed so Ryanair couldn’t use their bugle blowing music when we landed. It was an uneventful flight where I tried to read the paper but as I was stuck beside two professional drivers I was treated to the insights of a very complex and highly IT driven industry. We skipped through Stanstead and went to meet the bus. 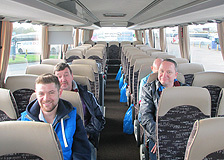 Normally we get a nice compact bus where we can all squash in and have a laugh – this time we were met by a 52 seater which was a bit rich considering our numbers! We had to wait a while before setting off as one of the Eddie Cox’s decided to go on the internet in the airport. Finally we were on our way and Liam refused to use the bus PA system to make his usual announcements. 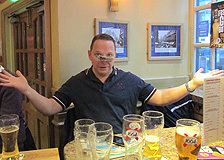 This did lead to some members not “hearing” the meeting schedule for the Sunday – the other Eddie Cox in particular. It was the usual arrangements – throw our bags in the hotel, head to Weatherspoons for breakfast, down to the shop, then in to M&Ms rather than the Queens for drinks (Dessie Doyle didn’t hear this part). The less said about the game the better. Suffice to say West Ham United robbed me of £47 (yes, you read that correctly) to watch a bunch of grown men avoid the opposition goal. We had a right footed player on the left wing, a left footed player on the right wing and a lard assed stocking up front! The two best players on the pitch, in my opinion, were Noble and Collison (who was substituted early in the 2nd half). The MOTM award went to Ravel Morrison who I admit didn’t play badly but we were all scratching our heads when his name was announced. I think our first shot on goal was in the 80th minute just shortly after Villa should have been a goal up following a magnificent display of one touch football. 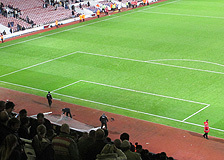 As soon as the final whistle blew the grounds staff took down the goal at the Booby Moore end which prompted us to wonder if Big Sam had decided on another new tactic – hide the goal!! 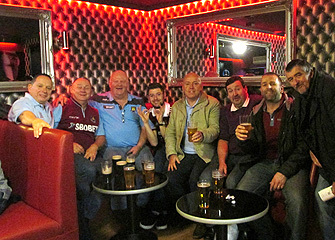 After the game it was back to M&Ms where we met up with our London buddies Steve and Malcolm. By the way congrats to Steve and Hayley on the news! Also in attendance was the legend that is Donegal John. 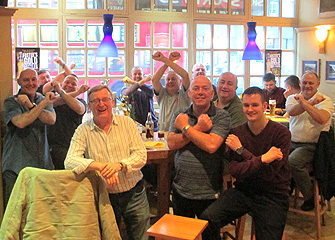 Dessie sold the Spot the Ball and won – he added to this win the following day in the Aldgate Exchange which has prompted us to wonder if he is x-raying the tickets as he comes through Security at the airport! Meanwhile Eddie and Liam brought the second Kevin Murphy off to Victoria and ran into some minor challenges as two trains broke down in Upton Park station. Suffice to say they are all that bit more familiar with the surrounding area now. Following the game of footie that was on the TV we headed back to the hotel to get ourselves some food and prepare for the night ahead. Dessie proved his worth as a leader in the public transport sector when he managed to find the bus that goes to Barking (number 5 and the fare is a staggering £2.40 for about six stops). It was off to O’Gradys “Nightclub” for the usual evening’s entertainment. The floor started to fill up as the DJ blasted out the 80s hits and we showed some of the younger folk how it should be done – it was murder on the dance floor alright! 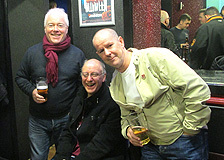 Big Dave was in attendance as usual and insisted his photo go on the website – over to you Paul. As the time grew late we headed back to the hotel where JT was shocked to learn that he couldn’t get a drink (he’s only known this for the last 10 trips!). David and Craig opted for the long walk back as they turned the wrong way when they left the place. The next morning saw Liam dish out more orders. Poor Dave Reid who had a quick stop in the Formula 1 hotel next door was instructed to be in the hotel lobby by 10.30am – he was bang on time. It was off to the Aldgate Exchange (nice one Tom Jones) on the tube where we had a great laugh at Liam’s ability to charm people. The pub is really good with both games on the TV, a couple of platters of food thrown in for free and convenient for our bus home to stop off. 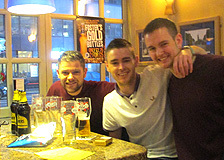 The downside of the pub is there’s no off licence nearby so it was a sobering journey back to Stanstead – come back Josh Holland! The driver was a bit late in showing up and there were one or two moments of anxiety for our chief minder. But in the end as the driver said “I’ll get you there in time” he was true to his word and did. 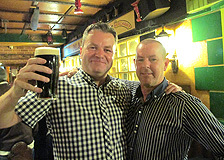 We immediately headed to the bar for the last one before trundling onto the flight for a well deserved rest. 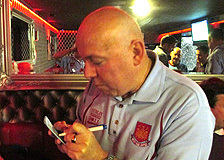 The verdict on the trip – a low turnout, a dour game in an atmosphere-less Upton Park but overall I wouldn’t have missed it. 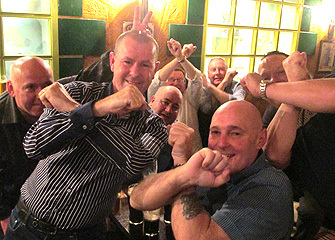 The President’s SAS (Stand Against Sam) campaign was raised following the match and may see a growing membership. 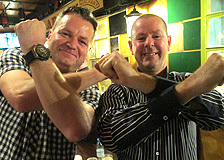 The most controversial thing to come out of the trip was the “appointment” of our new “Ambassador” Alan Corr! I’m not sure what the President will think of all this. 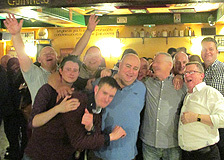 Special thanks to Gerry Murtagh for the report & photos.